For the biological subject, against electric shock from the amplifier’s power source(s)–or, how to not kill your patient while taking measurements! For the signal-to-noise ratio (SNR): isolation keeps the (60-Hz mains and other) noise out of the sensor pickup–and out of the amplifier input. 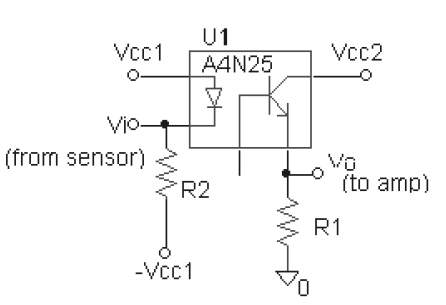 The sensor is connected to an LED, which outputs light of intensity proportional to signal voltage. The light from the LED falls on a photodiode or phototransistor, which is biased in such a way that current only flows when light hits the device, and the current (and thus measured voltage) is proportional to light intensity. Phototransistor output is to the amplifier. These devices are manufactured in one piece, so the frequency of light output from the LED is matched to the ideal absorption frequency of the phototransistor. However, there must be no electrical connection between the two sides of the circuit. More exactly, the impedance between the two circuits should be near a Teraohm ( ). Referenced Single-Ended: two leads of sensor are + signal and earth (computer) ground. Note: to avoid ground loops, it is best to avoid connecting sensor earth to computer earth. Non-Referenced Single-Ended: two leads of sensor are + signal and – signal, which is connected through a bias resistor to earth ground. Differential: three sensor leads are available: + and – signal and (earth) ground. The 4-BNC -to- DAQ-card lead you’ve probably used in a lab before is referenced single-ended: each of 4 sensors has available a signal wire, and the 4 sensors share a common ground wire. If the DAQ card is configured in Differential mode using this input lead, the signal gradually rises to a saturated level, as the DAQ card assumes a signal on the – differential input, which is in reality floating. Cross-talk: Because multiple signals share a ground wire, they also share some portion of the signal, so if only one input is connected that signal shows up, somewhat weakened, on the second input trace. Lack of isolation: using the ground wire as the negative signal lead means the subject and the amplifier are strongly coupled–and strong electric signals from the amplifier may travel to the subject. Also, stray noise (such as from the power mains) easily couples into the input. I’m talking a lot about DAQ cards, these are very important when working with A/D systems and analog and digital filters. If you are not familiar with these, go do a little light reading. Hopefully this is making enough sense to get the concepts across. The DAQ card comes with a finite number (16, in our case) of analog input ports (channels), each with paired input pins: a signal (ACH#) and a ground (AIGND). All the analog input ground pins are tied together on the DAQ card. In differential mode, the analog input ports are paired, so channel 1 uses AICH0 as +, AICH8 as -, and the ground wires for the pair are tied together as the reference ground. Thus a 16-channel DAQ card has only 8 channels in differential mode. Because no channels share leads, cross-talk is reduced. The DAQ card has high common-mode rejection, so if the – input leads are tied to ground (simplest configuration), channels will not interfere because the cross-talk is common to both + and – inputs. The ground lead cannot be isolated from the input electrodes without causing the DAQ circuitry to saturate, so the DAQ card itself does not provide isolation. R+ and R- provide bias current return paths. Bias currents result from not-quite infinite input impedance to the DAQ, and if not balanced the noise they represent will not be common to both + and – inputs, and thus won’t be rejected. However, R+ and R- load down the source with an equivalent 2R+, which will decrease gain if R+, R- are too low. If R+, R- are too large, they will produce a DC offset at the DAQ input. Bandwidth is a critical parameter in determining the type of amplifier needed. 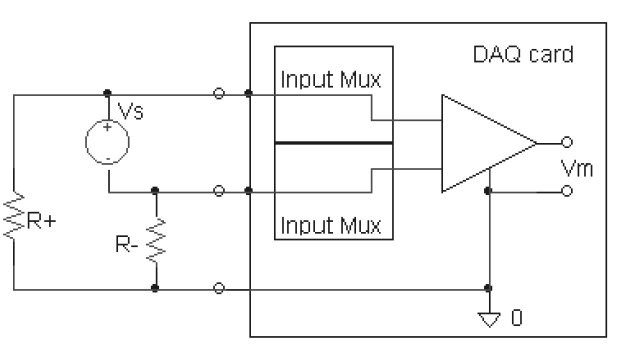 Often a bioamp has adjustable bandwidth; typical applications have both low-pass and high-pass adjustable filters. Can be either or both analog and/or digital. If digital, it is done by post-processing collected data. If analog, wiring of the printed-circuit board, handling of wires on the bench, and internal circuitry are all details to consider carefully. For equipment, against transient large signal sources–includes grounding the outer case of the equipment and surge protection, as well as isolation. AC (mains) with rectification and usually transformer isolation. Subject to power failures, risk of electrocution. Battery: provides its own isolation. Limited lifetime and undesirable behavior just before failure. (www.lockin.de)If the signal source is mostly at a single frequency but is very weak and/or subject to a great deal of noise, a lock-in amplifier can be used to extract the signal. In biological cases the single-frequency property of the signal is most-often externally generated, by applying a single-frequency excitation in one way or another. Integrating over an even number of cycles of the reference signal reduces all terms in ω1 to zero, so the displayed signal is proportional only to the amplitude of the component of the signal source at the reference frequency. To get the reference frequency into the signal source various means are employed: one may have to excite the subject (nerve, membrane…) at the reference frequency, or one may already know the source has a dominant resonance; alternatively one may look at each of several spectral components in the source signal piecemeal, by tuning the reference frequency. high input impedance, moderate gain, high CMRR. Often differential input and isolation. May include DC offset control, gain control switches, and/or calibration signal. removes thermal DC drift from a (very-low-frequency or DC) signal by using negative feedback and chopping the low-frequency signal at a frequency above the amplifier’s high-pass limit (effectively, this is frequency modulation). The signal can be reconstructed by demodulation after amplification; noise signals at both high frequencies and those below the chopper frequency are rejected.